Macon, Georgia has had its share of hitmakers over the years, including Little Richard, Otis Redding, The Allman Brothers and Randy Crawford, putting Claudine Clark in excellent company. Her season in the spotlight was the summer of 1962. It took a few years to get there, followed by a few years of trying to stay there, yet to no avail. She had to be satisfied with those three months in '62, June to September, and she truly made the most of it. When her family moved from Macon to Philadelphia, Claudine saw an opportunity to follow music as a career, studying at Combs College and auditioning for record labels in Philly and New York City. In 1958, at age 17, she had a one-record deal with the Herald label, releasing "Teenage Blues" to little notice. She later appeared on the small Philadelphia label Alma with a children's record, "The Get Set Song." Her best shot came with Bob Marcucci's Chancellor label (a major force for several years with hot Philly-born idols Frankie Avalon and Fabian). Clark had been writing her own songs for some time, yet the first single was a ballad, "Disappointed," written by Marcucci and session arranger Russ Faith. She got them to agree to use a song she'd written for the single's flip side, which would mean additional royalty money for the young singer if the A side became a hit. 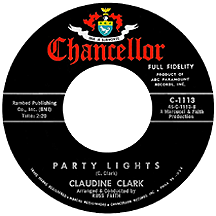 It was a variation on "Let Me In," a huge hit by The Sensations a few months earlier about a girl's so-called friends denying her access to a swingin' party; in Claudine's version of the story, "Party Lights," it was her mom who wouldn't let her join in the fun. Having a theme similar to the Sensations record was the likely reason it was not promoted as a potential hit; to Marcucci and company it was little more than a throwaway, its inclusion a gesture of good faith to the 21-year-old singer-songwriter. Unfortunately, "Disappointed" lived down to its title and it appeared her efforts concerning the B side were for naught. Then, without any urging from Chancellor's promotion department, stations began playing "Party Lights." Requests kicked in, stations from coast to coast joined in, and Claudine's self-penned little tune was a national top ten hit by August, regardless of whether anyone saw "Let Me In" as a lead-in. The song's message was relatable: catty friends and overprotective mothers! Who needs 'em? It just goes to show you can get revenge by writing a hit song. 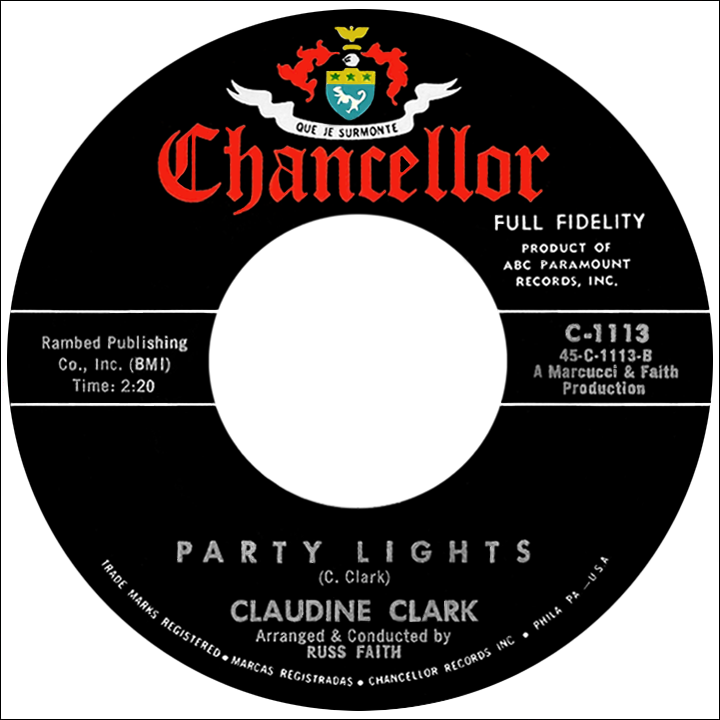 But Claudine's breakthrough turned out to be the last major hit for the Chancellor label (which closed operations around 1964) and her only hit single. There weren't even near-miss or low-chart records in her future; the follow-up, "Walkin' Through a Cemetary," a major departure from its predecessor, was a creepy, catchy attempt to jump on the Bobby (Boris) Pickett "Monster Mash" bandwagon for a '62 assault on Halloween. Claudine growled and stuttered in what for me is an underrated guilty pleasure, but the Pickett record got all the glory, and I mean all of it. "The Telephone Game," a strong B side as was the first single's hit flip, deserved attention but also went unnoticed. After a third Chancellor 45, Claudine was on her own again. Switching things up, she released one on Swan the following year as Joy Dawn ("Hang it Up"), then went back to her real name for two on the Jamie label in '64, including a remake of The Supremes' "Buttered Popcorn" (it hadn't been a hit for them either when released as their second single in 1961), followed by singles on TCF and Fayette, sounding much more mature on the latter 1966 effort, "Easy to Love (So Hard to Forget)." In 1969 she gave it a try as Sherry Pye ("Gimme a Break" on the Atlantic-distributed Match label), then focused on raising a family. Some gospel recordings followed, and she reportedly continues to sing regularly in church, while keeping her personal life out of the public eye. The one smart move Claudine Clark made, it turns out, was getting her own composition on the B side of that first Chancellor single. The radio airplay and many reissues of "Party Lights" have provided her with the royalty payments through the years that too many acts with even more than one hit have unjustly had to do without.